It takes a special talent to perform on stage as an instrumentalist and captivate an audience, Chet O�Connell has this ability. He has a warm stage presence and is a natural entertainer, add to this his skill as a guitarist and you get a total entertainment package. Chet O�Connell is one of New Zealand�s finest entertainers. At the age of 27, Chet is an accomplished performer with many credits to his name. Chet began performing at the tender age of 4, and by 12 was in a band. He was inspired by his father John, Peter Posa, Hank Marvin and the great Chet Atkins, and decided he wanted to become a professional guitarist. 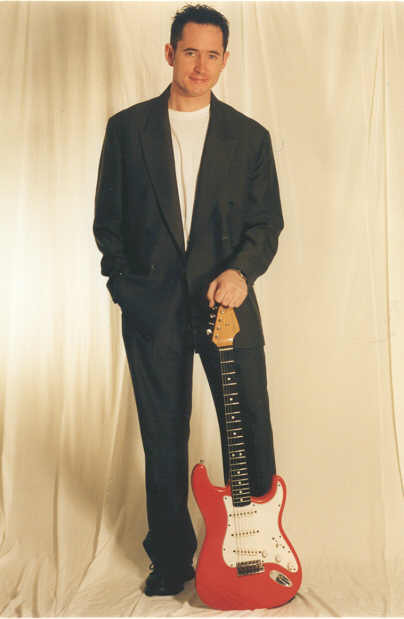 In the years that followed Chet began to develop his skills both as a guitarist and as an entertainer, and in 1993 was nominated for New Zealand Country Music Entertainer of the Year. In 1994 at the age of 19, Chet began performing in a cabaret show traveling throughout New Zealand performing all the instrumental guitar hits from artists such as; The Shadows, Ventures, and Peter Posa to name but a few. Chet developed into an exciting entertainer presenting outstanding guitar playing with an energetic performance that always left crowds wanting more. In 1995 Chet released his debut album �Strat-A-Various�, an album that showcased his fabulous guitar playing along with a couple of well produced vocal numbers. That same year he was also voted �Top Instrumentalist� by the Variety Artists Club of N.Z Inc. From 1995 to the present day Chet has been consistently busy performing various solo, band, and cabaret work throughout the country, both as a guitarist and vocalist. He has worked with many different entertainers and in 1997 was musical director for Sammy Harp, a singer/songwriter/harmonica player from Nashville on his New Zealand visit. Chet is not only an accomplished guitarist and vocalist, but also played drums in a band for 4 years, and still plays today when the situation arises. It is difficult to catagorise Chet in one particular style of music. Chet�s extensive repertoire sees him performing music ranging from �middle of the road�, classical and country, through to rock and blues. His vast musical ability has enabled him to move around the music scene with ease. Chet has been a star attraction at the �Bay of Islands Country Rock Festival� for the past 11 years, he traveled to South America in 1999 to perform with the �Pacific Asia Travel Association�, and that same year made a guest appearance at the �World Series Guitar Festival Concert� featuring guitar greats Tommy Emmanuel and Martin Taylor. Chet spent much of 2000 touring throughout New Zealand as Musical director/Guitarist/vocalist with a �Shania Twain Tribute show�. That same year he was also a nominee for Guitarist of the year. 2001 has seen Chet perform with Tommy Emmanuel, and also be confirmed to perform on the "World Series Guitar Festival Concert" held in New Zealand in November. Chet is a dynamic performer whether it be with his band or as a soloist, and has a �wicked sense of humour�. His guitar playing seems as natural and effortless as breathing and it�s his dedication to the instrument that has made his achievements possible. Chet O�Connell is an outstanding musician and a �first class crowd pleaser� - he has to be seen to be believed.